Luke Larson is the President of Axon, formerly TASER International. There’s no doubt the news media has been sharing what seems like a massive increase in the deteriorating relationship between law enforcement professionals and the communities they are paid to protect and serve. An element of the story that gets very little attention, if any, is the way in which technology is helping our law enforcement professionals do their jobs better, especially given the fact that our world is being disrupted in every way imaginable. I’m really excited about this episode — and I hope you enjoy hearing Luke Larson’s story as much as I did. Our vision is more ambitious than smart weapons, cameras, or software. Our long-term vision is to make the bullet obsolete. So, we actually spent a lot of time thinking through how we articulate that vision and what values we need to deliver on that vision. We’re a very mission-driven company. We have six really crystalized values: be obsessed, aim far, win right, own it, join forces and expect candor. But I want to take a moment before I talk about the values and really explore: Why does the company exist? One might assume, and might even be right in some cases, that the sole purpose of a company is to make money. But at our company, Axon, our primary motivation is larger than profits or products. Although these are both important and necessary components of a company, we firmly believe the best organizations create a unique contribution to society. The great ones focus on something different. And usually this is something that no one else is focused on, and they’re doing it in such a way that is so impactful that the world has to take notice. That’s what we think we’re doing here at Axon with our body cameras as well as the TASER weapons. We are a technology company, so we are passionate about technology. There’s a million different technology companies that look nothing like us. And to explain why we’re different, I think it’s really important to look at our origins. During the Kent State shootings in 1970, four unarmed college student protesters were killed and the nation was left muttering, ‘You know there’s gotta be a better way.’ Much like my troops and I were in Iraq… and during that time, President Lyndon B. Johnson issued a blue ribbon commission that called to the scientific community asking them to create less lethal weapons. Jack Cover invented this device, but it floundered in obscurity for about two decades. That is, until our Founder & CEO Rick Smith, a Harvard undergrad / University of Chicago MBA, when he was just finishing up school, two of his friends were killed in a road rage incident right here in Scottsdale, Arizona, just off of Scottsdale at the Hyatt resort. Scottsdale is a fluid community and a nice area. So, Rick had this same question lingering in his mind that society had after the Kent State shootings and I had after my tour to Iraq — there has to be a better way. Rick picked up the phone, and he found Jack living down in Tucson in the early 1990s. So, Rick in his early 20s, Jack in his late 70s — together, they really revamped the TASER weapon. And for about 10 years, the company kind of went through dips and starts. In the early 2000s, they released a weapon called the M26 that took the world by storm. That’s where TASERs are now nearly ubiquitous with most police agencies. The University of Cambridge and European think tank RAND did a study of 2,000 random officers in four different police units in the U.K. and two in the U.S., monitoring officers outfitted with the body camera. The decrease in complaints against the police when wearing them went down by 93%. It frees up officers to focus on the really serious issues in our communities. Absolutely. We believe the police records of the future will be on recorded devices — not written by people on keyboards. Police officers today say about two-thirds of their time is spent writing reports. It’s not time spent engaging with communities. This is a way to unlock value for all of society by giving them the technology they need. Our goal is to eventually eliminate paperwork, effectively tripling the police force. With regards to bringing the the team together, how do you balance the brilliance with the teamwork component at Axon? They’re the owner, and they see things through to completion. That’s why we’ve seen tremendous growth over the years. But that is also part of being one global team. So we have this idea of joining forces to do the kind of complex technical work that we’re doing. It’s a team sport, and we need tight integration across the entire ecosystem. Not only in how we design and develop products, but also how we bring them to market. How do we market and sell them? How do we also articulate the value to our customers? So, teamwork is something that’s very hard and it’s much harder than it seems on the surface. Especially when you’ve got a company scaling globally with 40 different markets with technology stacks ranging from werewolf to cloud to high-voltage electronics. I think the thing that really ties it all together is having a founder and CEO in Rick. It’s incredible because he has this very purpose-driven idea when he started the company. We really rally around that mission and purpose as we’ve grown. We’ve now created this value structure where people come to the company and truly want to be part of that team delivering on this mission and vision. 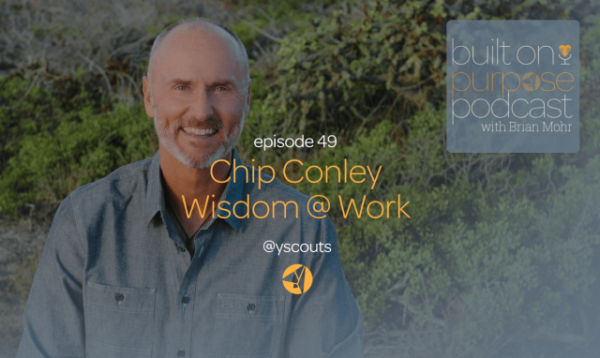 Listen to Luke Larson and more Built On Purpose Podcast guests at yscouts.com/podcast.